If my doctor had asked me in November last year if I wanted shoulder surgery my answer would have been yes. Without hesitation. Yes! Put me under. Give me the knife. Just make the pain stop! I was really, really over it by then. Physically pained, and mentally exhausted by living that way for so long. Despite all efforts, to rehab my torn rotator cuff in physical therapy I was still in a lot of pain, and had been for a year. Just to recap. Summer of 2016 I felt a twinge of pain in my shoulder when I did push-ups. By November of that year, the twinge of pain during exercise morphed into an excruciating stab of pain every time I reached for something above my head or to my right. By January 2017 I was in with my primary doctor, who suggested exercises (which I did faithfully) and a follow up appointment if it got worse. I went back to my primary in March. I was referred to Orthopedics, X-rayed and MRI'd. Diagnosis: 7 mm tear of the rotator cuff. I had my first physical therapy appointment in April. I was really committed to physical therapy three times per day. There was some improvement, but I was still in pain doing most of the exercises, up until my very last PT appointment in June before leaving the country for six weeks. That may or may not have been my undoing. It would be impossible to know for sure, but what I do know is that something changed at the end of August after I returned. Up to that point, sleeping flat on my back with my arm resting on pillows or holding onto a pillow and experiencing pain on a day to day basis was the norm. It always seemed to hurt worse at night for some reason. Just when I thought it couldn't possibly get worse it did. The pain escalated and became twice as bad as it had ever been. It ached and throbbed all day most days. I could no longer use my right arm at work, and my mobility was getting worse and worse. It was really scary, because I didn't know what was happening or how bad it would get. I already suffered from Insomnia, but sleeping became even more impossible. I dove back into physical therapy, but it became increasingly more and more unbearable. Not only that, but it was pretty clear that I was regressing. I completed three more physical therapy appointments before I went back to ortho in October, where she confirmed my worse fear. New Diagnosis: frozen shoulder also known as adhesive capsulitis. My shoulder was freezing. Soon it would be fully frozen, and after that it could take years for my shoulder to be normal again. If ever. Medical intervention would include a manipulation under anesthesia (MUA). I could quit PT if I wanted to (or continue) as it was not likely to be beneficial at this point. I went home, and did a bunch of internet researching. When I went back to ortho four weeks later, I felt so miserable and defeated when she told me the soonest that any surgery could even be considered is February. I needed to wait a full six to nine months to allow the complete freezing process to take place. By the time I saw her again in January the pain had lessened, as is typical once the freezing process is complete, and that's when I started to have doubts. Voluntary surgery is a tough decision to make. Nobody wants to sign up for pain and expose oneself to life threatening side effects for no good reason. I didn't want to jump the gun. After living with pain for so long it was kind of nice that there was some relief. My shoulder was far from normal, but it didn't hurt as much. If I had surgery I would be starting all over. The MUA is a procedure in which the surgeon would aggressively move and manipulate my arm to break up the scar tissue that occurs in adhesive capsulitis. If he didn't get the mobility he wanted from that he'd go in with tiny little scissors and cut it. The goal is to free my shoulder capsule from the thickened scar tissue that causes pain and prevents movement. I'd have at least 6-8 weeks of physical therapy. The plan was to put in a review request for surgery, and then have surgery scheduling call me a few months later for May/June surgery since I needed to wait for MJ to come home. I told her I still wasn't 100% sure, but agreed to let her put in the request anyway. I could still change my mind. I went back to see her in April, and I still wasn't sure. My shoulder was stuck as ever. There had been very minimal improvement of about 5% since November. I was definitely limited in movement and exercise, but I'd lived like that for so long I was sort of getting used to it. She told me that we shouldn't cancel the surgery. I could make the final decision at pre-op with the surgeon. So that's what I did. I debated the pros and cons endlessly. I researched. I refused to watch an MUA on YouTube, though. That I would not do. Some sources referred to MUA as a last resort, to be used only in extreme cases. The word barbaric was used. I read that MUA could make it worse or result in fractures. Other sources said it could be resolved with physical therapy, which I found in my case to be absolutely not true. My shoulder was freaking stuck. Raising my arm beyond a certain point was like trying to bend it backward. It would not go. No amount of physical therapy will help you bend your knee backwards without breaking something. I read tons of studies, but it was hard to find stories of real people and results from those who had actually done it. I had no idea what it would take to convince me one way or the other, or how I would ultimately make my decision. I was torn between wanting a normal shoulder and not wanting to get cut. What it ultimately came down to for me was when my doctor said, you are either going to intervene and have surgery or you are going wait out the full cycle three, four years or however long it might take for it to resolve on it's own. I had to make the decision blind, because no one could tell me exactly how long it would take to resolve on it's own, if it would for sure resolve, or how much mobility I would get back either way. I felt like I'd be more comfortable saying yes to surgery in August a full nine months after being frozen, but realistically what was really going to change between June and August? Not much except that August would be one of the worst timing ever for me to do surgery. It might mean I'd have to wait until December, and I was so so tired of the whole thing I wanted it to be over, one way or the other. I hadn't done an arm workout in over a year. Yoga was out of the question. I could barely clean my tub because my arm just couldn't reach the way it was supposed to. Sure, it was bearable. I learned to use a left handed mouse at work, had grown accustomed to not being able to lay on my right side, and sleeping on my back with my arms wrapped around pillows or a giant teddy bear. I adjusted my exercise routine to accommodate a not fully functional shoulder. You can learn to live with a lot, but the question was, did I want to? Did I want to continue to live my life with limited movement for who knows how long? The answer was no. We scheduled surgery for June 5th, just 1 1/2 weeks after my husband finally returned home. He was already planning to take a few weeks off before going back to work so he'd be home to help me recover. 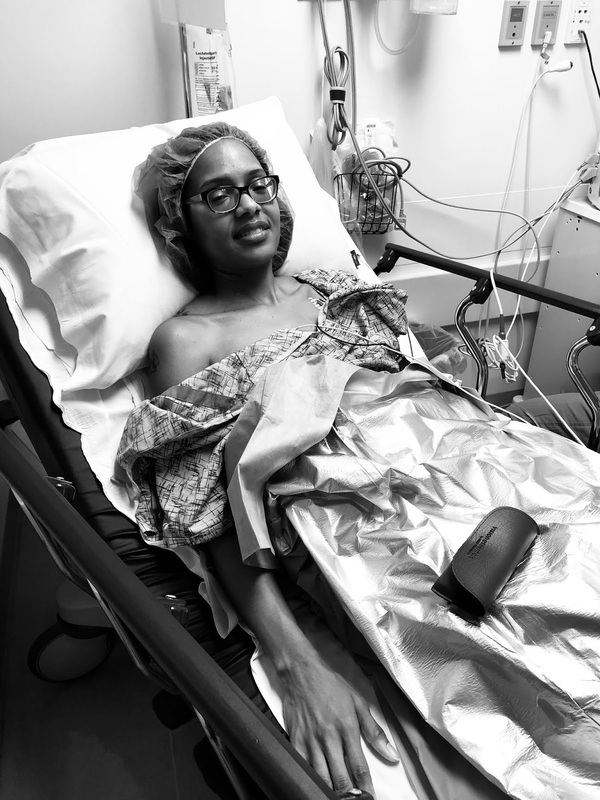 After agonizing over it for months, I made my final decision at my pre-op appointment the week before, but I didn't truly believe I was really doing it, until the last minute. I'm just weird like that. When I say last minute, I mean up until the minute we got into the car and headed south on the freeway towards the surgery center I did not believe I was really doing it. The surgery was not life or death. I didn't have to do it at all. I technically could cancel until the day of, so it didn't feel real until it was happening. The drive to the surgery center was surreal. Oh my gosh. I'm actually having surgery. No turning back now. Great. I checked in, and got my hospital bracelet. They called me back. I donned my hospital gown, stylish cap, and got settled in my bed. They inserted my IV. Just a pinch, not too bad. I met with anesthesia. For better or for worse, I was having surgery. I'm glad you went through with the surgery. I wouldn't exactly call your surgery elective. Although technically you did not have to have it, you did have to. Although you had become use to it, you don't have to live like that. You're young and your condition really impacted your quality of life. Praying that you have a speedy recovery! Right shoulder over here also. Had surgery currently going through PT. I'm impatient; I want full mobility now but I have to go through the process. It was worth it. The excruciating pain is gone and soon the soreness from PT will be gone. Glad that you are recovering well. Eeek. Surgery is always a big deal, no matter what scalpel happy surgeons say. However, sometimes it's necessary. Technically my spinal fusion was elective (technically?) but in reality, like yours, my quality of life would have been ruined in the long term if I hadn't had it. So I had it. I'm very glad your surgery went well and that your husband was home just in time to look after you! Sidenote, I'm waiting for the day when Surgery Chic is in fashion and suddenly we see models in hairnets on runways. One day. As someone who has already been through two surgeries, I can say that it is a very tough decision! Especially as you get older, and you have more responsibilities and don't have your parents to wait around you, like you did when you were a kid. However, it sounds like you made the right decision! You have to think about the quality of life you're currently living, and how surgery will improve that. MUA sounds super painful. You were brave to have surgery! How are you recovering?